Gardner Denver's new guide on the latest predictive and preventative maintenance strategies for compressed air users. Industrial compressor and vacuum manufacturer, Gardner Denver, has published a free new guide on the latest predictive and preventative maintenance strategies that compressed air users can implement to improve efficiency. The guide considers how businesses are now focusing on the maintenance strategies that can help improve a system’s whole life costs. It covers the insights that data analytics and Industry 4.0 can provide, as well as the benefits of using genuine spare parts and lubricants. It also provides an overview of the savings that are possible through identifying air leaks and by undertaking energy audits, as well as the benefits offered with local servicing. Keith Atkinson, EMEAI sales manager at Gardner Denver, explains: “With UK industry using more than 20TWh of electricity every year to compress air, any steps that can help reduce energy costs are to be encouraged. 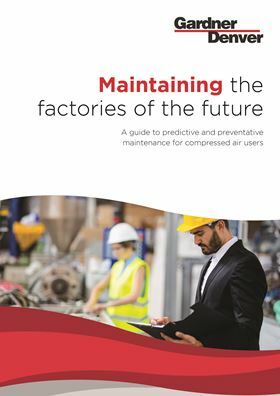 We have developed this free new guide to address these issues in more detail, demonstrating how implementing the right predictive and preventative maintenance strategies can cut costs and improve operational efficiencies." Compressed air users can see the maintenance guide here and learn more about the maintenance opportunities available with Industry 4.0, genuine parts and local servicing.